Once just populating high school reading lists and serving as jumping-off points for theoretical discussions, cautionary tales of life under totalitarian governments are topping best-selling books lists of 2017. 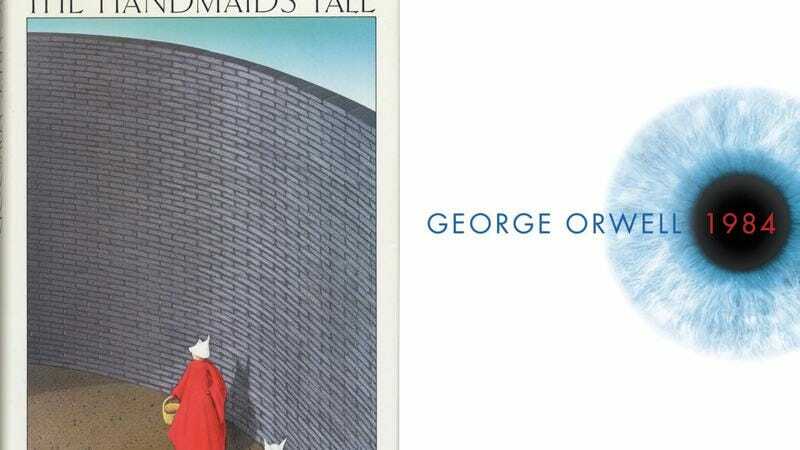 George Orwell’s 1984 and Margaret Atwood’s The Handmaid’s Tale have both been sitting pretty at the top of Amazon’s best-seller list for the past few months, with Ray Bradbury’s Fahrenheit 451, and Sinclair Lewis’ It Can’t Happen Here, and Aldous Huxley’s Brave New World (this writer’s personal favorite of the dystopian genre) also gaining traction. Anyone wondering why these classics are suddenly popular need only turn on the news. AP reports that nonfiction books exploring total state authority are also seeing bumps, including Hannah Arendt’s 1951 Origins Of Totalitarianism. In a recent interview with George Saunders, he told us he’s reading and recommending the book I Will Bear Witness, a diary kept during the Holocaust and “a real-time picture of what it looks like when demagogues take over,” in Saunders’ words.